McCain is always such a drama queen. Is this what we want in a president? No convention today! ... OK, it's on! ... The economy's sound... No, wait, it's going to fall apart unless I go to Washington tomorrow! ... We need a commission! ... We need to fire somebody! ... Get me Andrew Cuomo! ... I want ten more debates! ... But let's postpone the one we've scheduled! 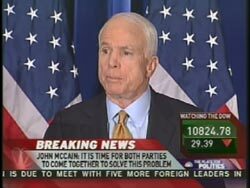 ... Do you get the impression a McCain presidency would be a bit exhausting? McCain actually threatened to cut and run from a nationally televised debate to be watched by over 80 Million people. And why is McCain's left eye blinking wildly? Is that something I have to look forward to when I'm nearing 80?